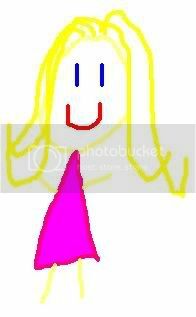 Yesterday and today while taking the kids to school, I noticed guys at the entrances to several of the circles on Zahran Street sticking small post-its on the rear windows of cars. Therewere also people on the side of the road and on top of the fourth circle counting cars. I can only hope that they realize there are significant traffic problems and are beginning to think about how to overcome them. Unfortunately, they only seem to be doing the work during the morning rush hour. For the fourth circle, you don't see it's ridiculous traffic until lunchtime. I hope that won't negatively impact their review. Anyone out there know what exactly they're doing? Curiosity has definitely been a failing of mine, and right now it's running rampant. So, last night I truly intended to make it to the Blogger meet-up. I set an alarm on my phone for 6 pm (here's the first problem) and thought about it a couple of times during the day. And then, life happened. We got the kids to bed (earlier than usual actually). My alarm went off while they were eating dinner and I mentioned the meeting to El 3atal. He seemed non-plussed, but I figured I could guilt him into going. Then, I forgot. We finished getting the kids to bed and I sat down to eat dinner. It wasn't until Kinzi called me at 9:15 that I realized that I'd forgotten the event once again. Now, I'm annoyed at myself. Next time, I'll set the alarm for 7:15. Maybe I'll make it. But, I did push El 3atal into promising that next event, he'd go. So, see you next Jordanian blogosphere! El 3atal and I were out driving today when we saw the below sight. As you'll see, the small white car isn't depending on any old car manufacturer and the brake they might have installed on the car, they've created their own. To set the stage for you, this is at the top of a very tall, very steep hill. That's what I'd call a creative contraption. They say necessity is the mother of invention (or was that intervention, either of which are appropriate here). You've GOT to be kidding! They should be ashamed. Okay, normally I don't like to call out specific products unless I'm happy with them. In the spirit of this, I'll simply say that the largest cell phone service provider in town has been working in my neighborhood. The day before the snow, they dug up our driveway, did a little work, then went home having put couple of rocks into the trench. And then came the snow... So, imagine trying to get out of my narrow driveway slipping and sliding across the trench. It was NOT a pretty sight (let's not talk about the fact that I got all the way down to the school before I found out there was no school). So, then another couple of days of improvised improvements by our guard (placing paving stones in the trench and replacing them as the weight of the car broke them) and the guys came back to start filling the trench in. I pick the kids up at school, head home and viola! Look what I found waiting for me! Yes, this impassable mess is directly in front of my driveway. 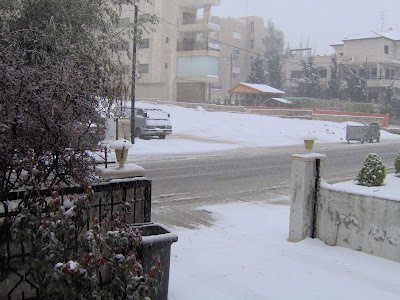 As El 3atal said, the entire curb in front of the house was empty, not a car around. So, where do they dump the sand and stick their barrel? In front of our driveway of course! It was rendered unusable overnight and well into the next day when El 3atal went and shouted at them. The finally removed the barrel, bucket, and most of the sand. The remainder of the debris was apparently our problem. 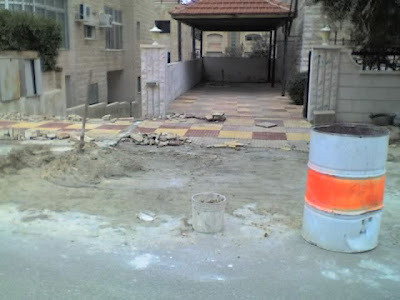 We watched our neighbors removing broken pieces of paving stones, sand, etc. Oh, and the guys who responded to El 3atal's shouts used our guard's squeegee thing, broke it, then returned it. How thoughtful. All I can say is Company X (and we all know who you are), you should be ashamed to let your contractors represent your name like this. I'm a customer, and a fairly satisfied one, but this makes me think less of the company as a whole. 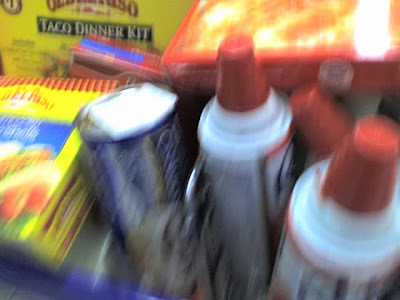 Guessing Game: What Country is this Shopping Cart in? We Moved To Jordan, Right? As the seasons change and spring nears, my mind turns to Crawfish boils and outdoor activities in Louisiana. Yes, that's right it's already good enough weather to be outside playing in LA. But, here I am in Jordan, right? Or am I? Yesterday shopping, I happened upon the below. Yep, that's right, Zatarain's has made it to Jordan! Now, you can have your own crawfish boil right here in the high desert. When I saw the Zatarain's, I thought I was back in Louiaisna, until I looked next to it and saw spices and stuff in Arabic packaging. I'd tell you what, but I have no clue... So, welcome to Louisiana - Jordan Style. 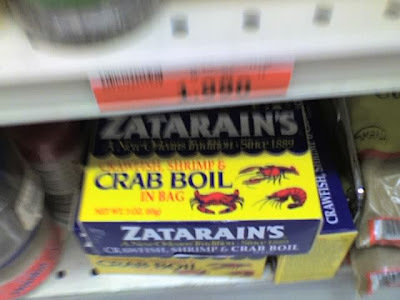 Pick up some Zatarain's and have yourself a crawfish boil. Next, I expect we'll start seeing the cheesy Zatarain's commercials. I guess, given the high likelihood of freak snowstorms in March back home in AL, I might have expected it, but I truly didn't. And, in the 8 years we lived in Louisiana, it snowed twice, at night, and melted by morning. So, little chance was expected there and then Jordan surprised me in a big way :). 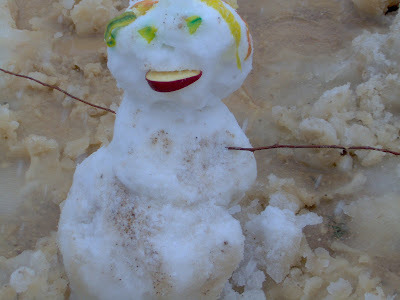 So, we bundled up the kids and carried on the age-old tradition of bundling up in not nearly enough clothes, going outside, and making a snowman. As a child in Alabama, we'd have to collect the snow from 3-4 yards to make a presentable snowman. This year. 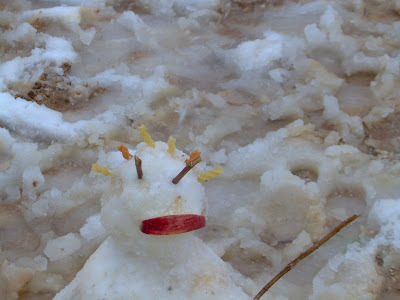 given the kids' ages, we weren't so worried about the presentability of the snowmen, just that they made some. And, so, here are our crowning glories. 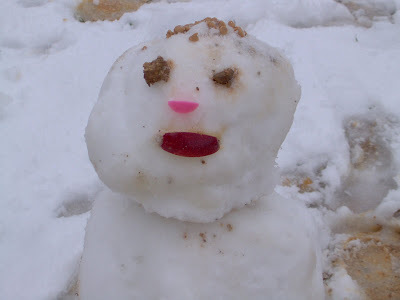 First is ButterBean's "snow big sister"
Happy playing in the snow! If you don't know what your copmany does, should we? When we bought our car, I noticed it has a very interesting option. It's an option that I've never seen in a car in the US. I don't really think it exists in the US (probably because there isn't much need). In our fine bean-mobile, you push a button on the driver's side door and the mirrors fold in automatically. Now, this was brought into my consciousness when I saw someone parked down near the first circle on those tight streets with people parked on both side (up on the curb no less) who didn't put their mirrors in. Then I realized that it was an American-made care and the mirrors don't even fold in at all (only American cars I imagine would not fold in at all). It got me to thinking about this nice little button that I use ALL the time now. I can hardly imagine being without it. And yet, 9 months ago I couldn't even imagine such an option or the need for it. The flower, the color, or something else entirely? While I was shopping, I came across the most interesting meat, so I grabbed snapshot of it. 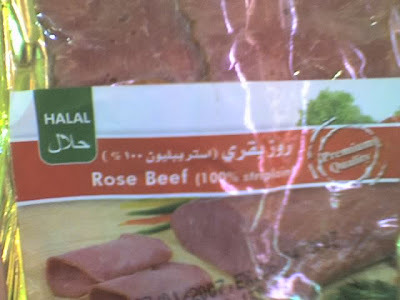 I have never before heard of "rose" beef. I guess it is rather red in color, although I wouldn't say it's that rosy. So, as always, I thought I'd share the smile and invite you all to drop by for a rose beef sandwich! It's interesting to see how differently various people deal with stress. Some become grumpy and snappy, some start losing sleep, some have breakdowns. Me, I internalize stress. What does that mean? Well, I end up giving my insides fits in various ways. I always know I'm more stressed than I admit to myself by how noticeable my various health issues are. And, it's funny that I try to convince myself that I am not as stressed as I am. But, my body doesn't lie. In my life with El 3atal, it seems that we never have major life changing events one at a time. Experts say that they key to integrating major life changes is by doing them separately. When we got married, we also moved across the US, and I changed jobs. When we had our first bean, I got laid off and we moved. When we had our second and third beans, I got a new boss and we got a new Nanny. 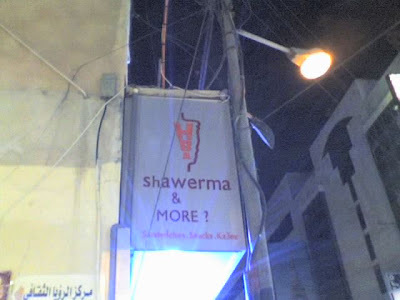 When we came to Jordan, we moved and changed jobs. So, really we can't seem to do these things one at a time. I wonder why that is... Is it something about us that makes us major life changers? And now, we're on the cusp of a major life change again (no move involved as far as I know) and I find myself predictably stressed. But, I wonder how much of that is work stress rather than life stress. So, maybe I need to make a different life change that the ones in process... At any rate, bear with my sporadic posting as we navigate these new waters!